These islands have been claimed by both South Korea and Japan. East of South Korea and north of Japan are two volcanic islets flanked by a spray of smaller rocks. The island cluster spans about 46 acres, and except for a few dormitories that house a rotating battalion of approximately 40 police officers, a helicopter pad, a house, a small library, a cafeteria, and a mailbox declaring its terms of service (mail pick up and delivery every two months), there is no development. Aside from the police stationed on the island for two months at a time, the islands boast a population of two. But the islands’ unspoiled tranquility belies a fractious dispute over their ownership. South Korea and Japan both claim them, though they use different names for the islands and for the body of water that surrounds them. 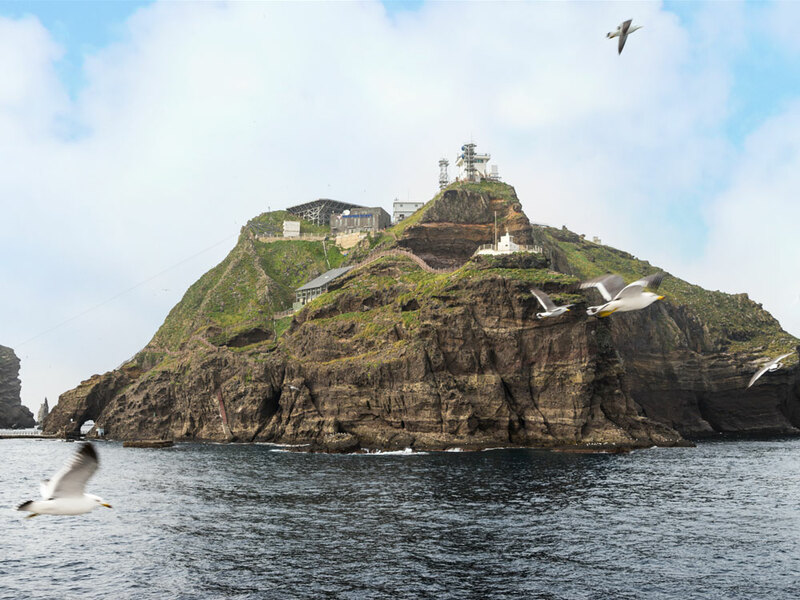 South Korea calls the islets Dokdo, or “solitary islands,” and says they are in the East Sea. Japan says they are Takeshima, or “bamboo islands,” in the Sea of Japan. The ownership feud has simmered for decades. Both countries claim ties they trace back through centuries. The spat also has more contemporary resonance caused by disputes dating from Japan’s colonial rule. Traditionally, experts measure tensions around such disputes by tracking diplomatic recalls or political protests. 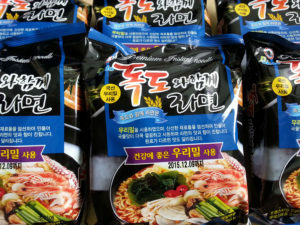 But Jiun Bang, a postdoctoral fellow in the Nam Center for Korean Studies, has developed a completely different method: She uses noodles and bread. 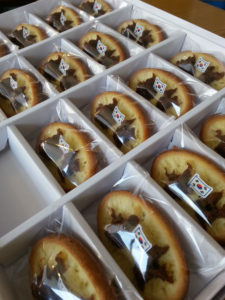 “The shape of the bread is exactly the same as the islands,” Bang says, referring to a brand of Korean bread known as “Dokdo Bread.” “The CEO wanted to make sure it reflected the island’s actual geographic shape.” The bread is not only geographically accurate; each piece comes with a Korean flag planted into the islands. One can buy Dokdo bread, Dokdo ramen, Dokdo cookies, even Dodo drinks. Bang is interested in the way nationalistic fervor around territorial disputes such as Dokdo-Takeshima can be measured by the way nationalism is commodified into products that one can buy. In Dokdo’s case, for example, one can buy Dokdo bread, Dokdo ramen, or Dokdo cookies, as well as Dokdo drinks. One can do business with Dokdo companies, such as the Dokdo Fishing Company (not, by the way, located on Dokdo). Even when Dokdo is not part of a company’s name, it can be included in its branding. One company invokes listening to the sounds of Dokdo—its winds and birds and lapping waves—as incentive for people who have difficulty hearing to buy their brand of hearing aid. The words nationalism and patriotism are often used interchangeably, though they have significant differences. Unlike patriots, who feel pride and affection for their country, nationalists feel their country is superior to another, especially when the countries have a history of distrust. Traditionally, nationalist movements are either thought to begin with government elites who manipulate the masses or with a populace that unites against an oppressive system. Bang thinks nationalism doesn’t only travel from the top down or the bottom up. She maintains it can also move sideways. The momentum also has another purpose, she says: to keep the issue at the forefront of people’s minds in order to keep the tension high. Because of South Korea’s legacy of contention with Japan, there is always a simmering resentment. The media reports moments when it flares into anger, but otherwise the dispute doesn’t get a lot of media attention. Scholarly papers record the officially voiced spikes of indignation in the disputes between the two countries, but, says Bang, they don’t capture the grievance that colors people’s everyday lives—or the fact that while tensions flare, they also subside. Nationalistic products do reflect this ebb and flow, she says, and also capture the important part everyday people play in this pattern of increasing and decreasing nationalist feeling.